Looks like the crazy roller-coaster period of the past two months, of highs of Alpha Nomads creations and lows of time pressured dev work, is stabilizing. 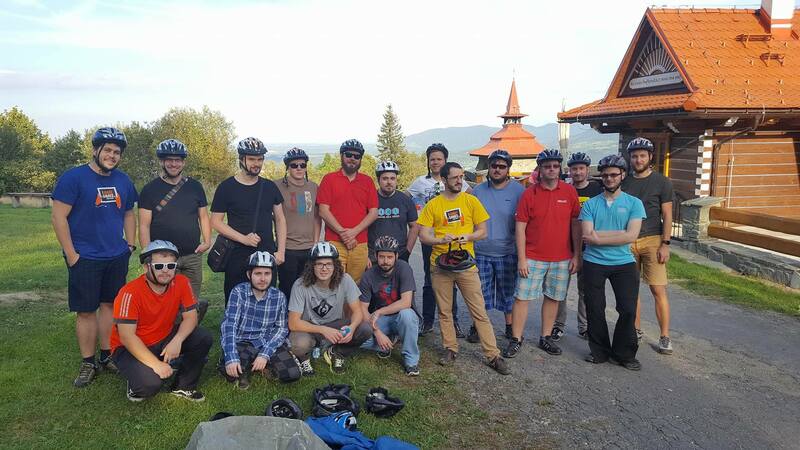 We refreshed at holidays last week and at a weekend team-building event in Beskydy mountains (there are no Tigers among us). The plan for October is up on Trello. A lot of work is still connected with the Golden Manager revolution and we are also exploring some great new opportunities and features. A significant work-time was spent on the Golden Manager - a complete under-the-hood rework of how the individual parts of Planet Nomads work and communicate with each other. The system of Golden Manager itself is very much done, but as it turns out there are many related systems that need rework too. Main character animations, stats and attributes, the need to approach the drill, cutter and welder tools differently, multiple GUI have to be adjusted to the different input system and include the newly budding inventory and crafting, to name a few. Nomads, we know you are hungry for new updates and content to be added to the alpha. The thing is, everything's changed. It will take time to get the current developer version of Planet Nomads to the level of alpha and then to start building atop of that again. It is a painful period, and we hate to be seemingly treading water, yet the benefits will be tenfold. It will be easier to change, modify and add stuff in not-so-distant future. Modders will appreciate the systematic approach used in the Golden Manager. We are trying to approach the dev work as if we were modders ourselves already. Unifying items and world objects to allow seamless changes and additions later on. In the end it will be a treat for the whole community with the added benefit of user-generated content. Not everyone have their hands tied with the Golden Manager however! You'll be happy to know that Martin Š. created atmospheric scattering that is both realistic and out of this world. The original solution in Unity had a locked atmosphere thickness of about 800 metres which meant you could see stars during the day by climbing a hundred meters higher. Martin took the solution from Sean O'Neil and rewrote it for GPU. This solution takes into account the position of the player and the sun angle, so we can realistically portray sunset or sunrise and everything in between, whether you are looking from the ground or from space. We can also change the wave-length of the sunlight, allowing for colorful skies quite different from the Earth experience. It takes some imagination to see the power of the atmosphere in these static images, but wait till you see it in the game, Nomads. 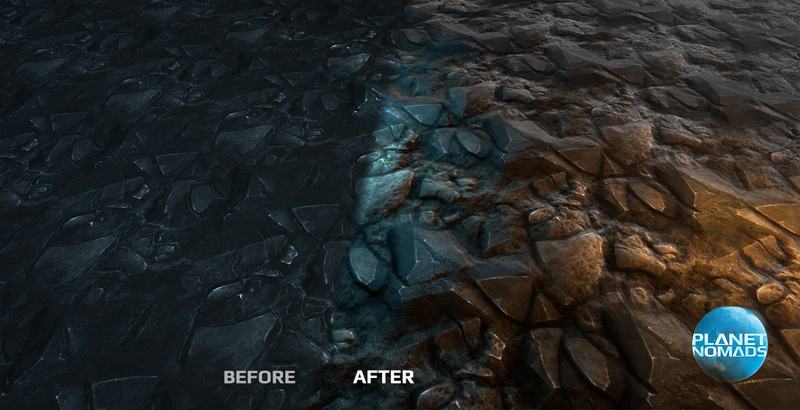 Another improvement comes with the upcoming triplanar PBR shader we're going to use on ground textures. It works on spherical planets and uses vertex paint for better blending between voxels. We'll use texture array from Unity 5.4 in addition to our noise textures and distance-based tiling and the final result looks way better than the current ground known from alpha. In terms of numbers, according to Tomas' calculations where we previously could use 10 textures at a time, we can now have 80. Should be amazing be the numbers themselves! Again, the newly gained plasticity and roughness of the terrain is best experienced in the game. Besides all the technical improvements, we are first and foremost creating a game. So Petr and Tomas has been spending their weekends constantly overthinking how Planet Nomads should play and then confronting their ideas with the rest of the team. While everything is still subject to change, we have now settled on activity-based skills which improve as you build, craft, mine and explore and gets reset when you die - in order to minimize players using death as a teleportation system. There will be multiple quality tiers for tools, building blocks and armor, and a special node-based upgrading of equipment. These ideas are still maturing and we'll present them in more detail. The future holds good stuff, Nomads. For instance the cave system and more diverse topography that Martin D. has been working on will surely make you smile. Hang in there as we chisel these features for you to enjoy. If all goes well, we're going to present them in Nomadic Journals in two weeks.